I was detecting a wooded area and had only found trash items. Using my AT-Pro I got a signal that was in the high 80's.Thinking it was another beer can I used my shovel to dig a plug of dirt. Looking into the hole I could not believe there were large coins lying in the dirt. I started pulling Morgan silver dollars out of the hole. 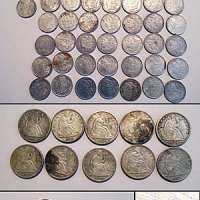 Mixed in were smaller coins that turned out to be seated half dollars. Securing the coins I decided to check on last time and got a signal in the 50's. Using my shovel again Which I should not have and I saw the color of gold! It turned out to be a ten dollar Gold Eagle. Needless to say I was in shock from the number of coins that came out of that hole. 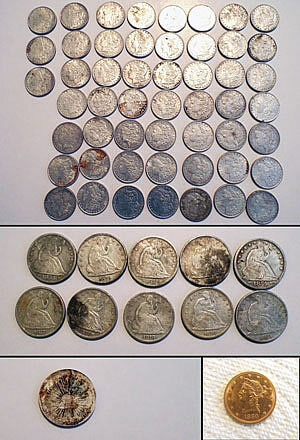 52 Morgan silver dollars,10 seated half dollars, 1 silver 8 Reales, and 1 ten dollar Gold Eagle.